My video still says there's reward tiers, but it is a dirty liar. This is a glorified tip jar. Yo! I'm Li " Shockodile" Zard and I make the webcomic Hellbound Guardian. Hellbound Guardian is an action/comedy story about people who die and make bad decisions (not necessarily in that order, but mostly in that order) resulting in them having to fight demons and other sludgy monsters. It contains plenty of things that I love; headstrong dumbasses, powerful non-binary folks, reptiles both giant and tiny, and fantasy garbage happening to regular people. More specifically, it follows Avery, a young adult who's spent most of her recent years struggling to deal with her PTSD after a childhood trauma. Her impulsive reactions and poor coping methods are more than questionable, often landing her in more trouble than she was in to begin with. It's a challenge, but overcoming the hurdles and finding healthy ways to go on are integral to her success in her latest misadventure: fighting back a demon army as a holy guardian of humanity. She's not thrilled. I want making Hellbound to be my full-time focus, and I am still crazy enough to think I could do it one day! Every pledge gets me that much closer to dedicating 100% of my energy to sharing Hellbound Guardian with you. In the short term, my goal is to make Hellbound as high-quality as possible. In the long-term, I hope I live that long. Your support will be helping me do exactly that! The comic! I'd like to be producing at least two pages a week, every week. There are other things I'd like to make as well, but I only have so many green arms and a lot of art to do, so I'm just gonna focus on making the comic for now. 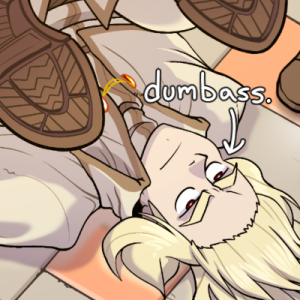 I hope you'll consider contributing to Hellbound Guardian, so that I might return the favor by surviving long enough to complete this dang comic! Bark!! Thank you so much!! Bark Bark!! Thank you so much x2!!! WOW! SO BEAUTIFUL!! Thank you so much x3!!! At $999 a month, I will remove this unsightly joke goal from my page, much to the assured relief of everyone who comes here.